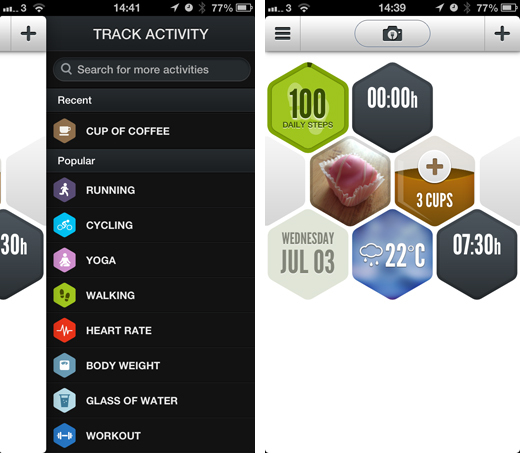 Smartphone apps can be an insightful and motivational way of monitoring your daily exercise, sleep patterns and diet. Few apps combine these data points together, however, offering a holistic and truly useful way of measuring your overall health and well-being. Argus tries to solve this by supporting all sorts of metrics in a single interface. Tapping the plus symbol in the upper right corner of the home screen reveals a dizzying list of activity types, including popular forms of exercise such as running, cycling and walking. These are pretty common for dedicated fitness apps such as Nike+ Running and Runtastic, but it’s the addition of body weight and heart rate monitoring, as well as water, coffee and food intake that makes Argus a much broader tool for improving personal health and wellbeing. A long-standing and still unsolved issue with apps like Argus is the reliance on manual updates. 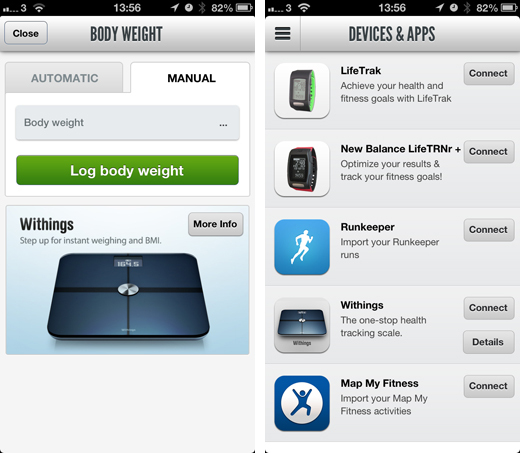 A few third-party apps such as Runkeeper and Withings are supported for instant data related to running and your personal weight. A couple of smartwatches are also supported, but none of the popular ones that you would expect; Fitbit, Nike Fuelband and Jawbone’s UP are all missing at present. It means that for the most part, you’re required to input all of the data yourself. This includes when you fall asleep and wake up, as well as the number of empty coffee cups stacked on your desk. 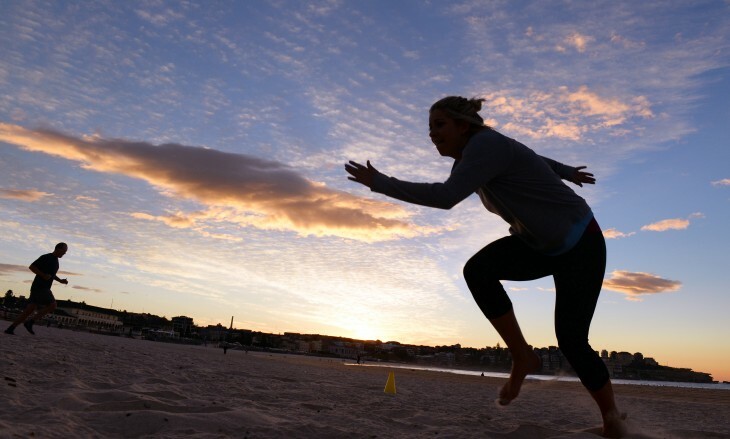 Until there’s a better way of collating this data manually and effortlessly – like Moves does with running and walking – it’s hard to stay motivated and simply too easy to forget that frappucino you had while meeting a friend in town. One solution is to integrate the existing apps developed by Azumio – the team behind Argus. These include Fitness Buddy, Instant Heart Rate, Sleep Time and Instant Fitness. It’s a robust means of automating this process and one that’s understandable given that Azumio wants to grow the userbase for its other apps; nevertheless, support for other and arguably more popular third-party apps is sorely missed here. The caveat is that the overall design and interface is pretty beautiful to behold, with a simple hexagon theme running throughout. Individual activities stack together on the home screen, and there’s also the option to take photographs of your food and add them into the mix. Scrolling up and down is intuitive and all of the information is served up in an easily digestible format. Goals and challenges are the last piece of the puzzle. Argus offers three different types at the moment, based on the amount of sleep you get each night, the distance you walk and the amount of water you drink. They’re a little restrictive, but make sense given the data that’s being collected. Taking a picture of your meal, for instance, doesn’t log the calories or nutritional value, thereby invalidating it from any form of serious data analysis. 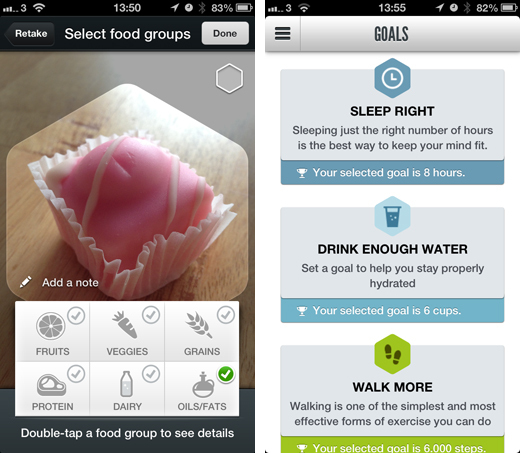 The end-goal is to have an app that tracks all of your data automatically and then offers up goals and recommendations based on your daily activity. The trick here is to have a system that can compare and draw conclusions from multiple data points – realizing that a lack of sleep is forcing you to drink more coffee, or encouraging you to exercise less is an extremely valuable insight. Argus has a ‘trends’ screen that comes closer than anyone to realizing this vision. It shows all of the different data types as a color-coded chart, but forces the user to draw their own conclusions. If you want a new way to monitor your every step, meal and nap, Argus is therefore a pretty good option.